At Steinway, our guiding principle is building to a standard, not a price. If your Steinway is in need of restoration services, the only way to ensure that 100% genuine Steinway parts are being used is through the Steinway Restoration Center. Some parts, such as the proprietary Steinway soundboard, are simply not available to other piano restoration companies or individuals. If you restore your Steinway somewhere else, you will no longer have a genuine Steinway & Sons diaphragmatic soundboard (the lifeblood of the instrument). Steinway never sells its soundboards, and without one, the instrument loses the magic that makes it a Steinway. In other cases, even when Steinway parts are available, restoration companies can opt for cheaper imitation parts. A Steinway is not only a piece of stunning beauty that sounds like no other piano, it is also a sound investment. If you restore a Steinway piano and don’t receive our certificate guaranteeing the piano has been restored with 100% genuine Steinway parts, you are compromising the value of your Steinway. Just as all pianos are not created equal — Steinway remains the choice of 9 out of 10 concert artists — all restoration services are not the same. When you restore your Steinway at the Steinway Restoration Center, you are ensuring the continued greatness of the instrument. Steinway is the only company with the combination of knowledge, experience, facilities, and materials to ensure that your instrument remains a Steinway in every respect. A Steinways achieves its greatness not only through the skill and talent of the factory craftspeople, but also through the years of perfecting tools, processes, and conditioning environments. No restoration company or individual can offer what Steinway offers. When you restore your Steinway at the Steinway Restoration Center, you are guaranteed 100% genuine Steinway parts and replacement of key parts — not repair of old parts or polishing of old hardware. A complete, new Steinway action is used to replace the old — we never simply repair the existing action. And we replace all of the hardware on the piano with genuine Steinway parts, whereas someone else might polish the existing hardware to look new, when it might be worn and in need of replacement. The Steinway Restoration Center is the only authorized Steinway piano rebuilder in the world — and the only place where you are guaranteed that 100% genuine Steinway parts will be used to restore your Steinway. We accept pianos from institutions, piano technicians, and retailers, as well as from private owners. All work is backed by an all-inclusive 5-year Steinway warranty — the same as a brand new Steinway. For future investment appraisal or sale, you’ll receive a dated certification record indicating that your piano has been restored by Steinway & Sons using 100% genuine Steinway parts. 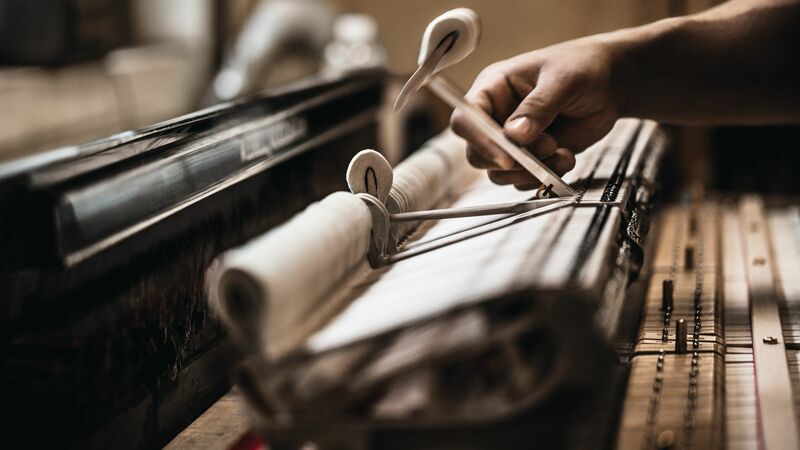 Whether your cherished Steinway is in need of custom refinishing, or replacement of the action or soundboard, it couldn’t be in better hands — the hands that originally built it. The location of your piano in need of restoration is not important — as we regularly have pianos shipped to our factory/restoration center from all over the world and back to the owner in pristine, restored condition. Why the Steinway Restoration Center? If you are considering the restoration of your Steinway, the only option that ensures your instrument will continue to live up to the legacy of the Steinway & Sons trademark adorning it is the Steinway Restoration Center. To speak with a representative about restoration of your Steinway piano please call (718) 204-3122 or fill out the form below. Ensure that your piano continues to live up to its legacy. Thank you. A Steinway representative will be in touch.